September Daring Cooks: Lookit me, I’m cooking vegan! Justin and I are completely devoted and unabashed carnivores – we love our meat (haha) in a wide variety of types and preparations, and at least 4 our of our 7 meals every week include it in some form. But we also love our vegetables and eat what I believe is an unusually high percentage and variety of fresh produce. I like to think that we have a very well-balanced diet and get a lot more vital nutrients just through our food that the majority of Americans do, simply because we eat so many veggies. Despite our love of all that greenery and the relatively common appearance of vegetarian meals in our repertoire, we’ve never made any real attempt to cook anything that’s vegan. And since its really pretty easy to do so, and since vegan meals are naturally quite healthy, I think that’s quite a shame. So imagine my delight when I learned that the September challenge for the Daring Cooks was a vegan dish, not to mention something that I’ve never tried before. Its a double-whammy of brand-new experiences, and I’m really quite happy about it. So, the challenge. 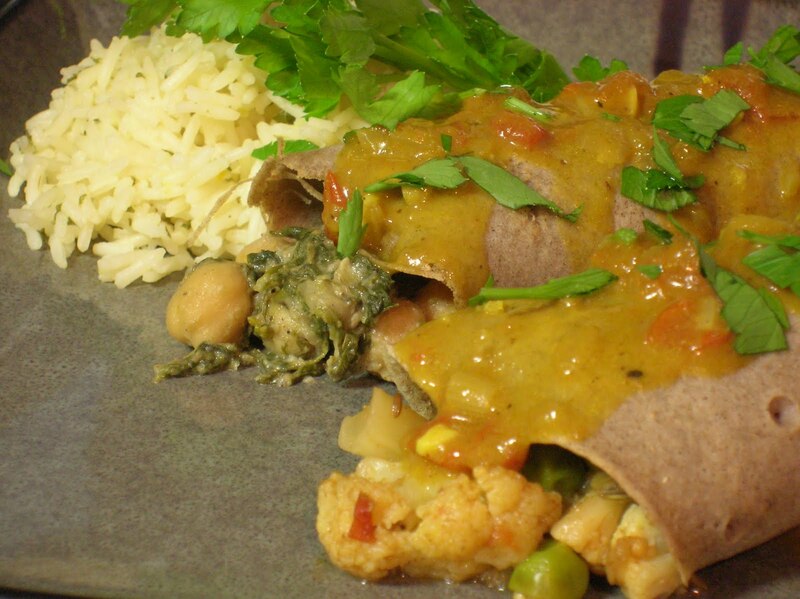 Debyi of The Healthy Vegan Kitchen chose this recipe from Fresh Restaurants, a vegan chain in Canada, for Indian Dosas with Curried Chickpea filling and Curry Coconut sauce for September, and the one major stipulation of the challenge was that it must be made with absolutely no animal products. So, that means no dairy, eggs, or animal fat in addition to the omission of any sort of meat. A challenge indeed for someone who regularly includes dairy and eggs in her diet even when there’s no meat to be seen. 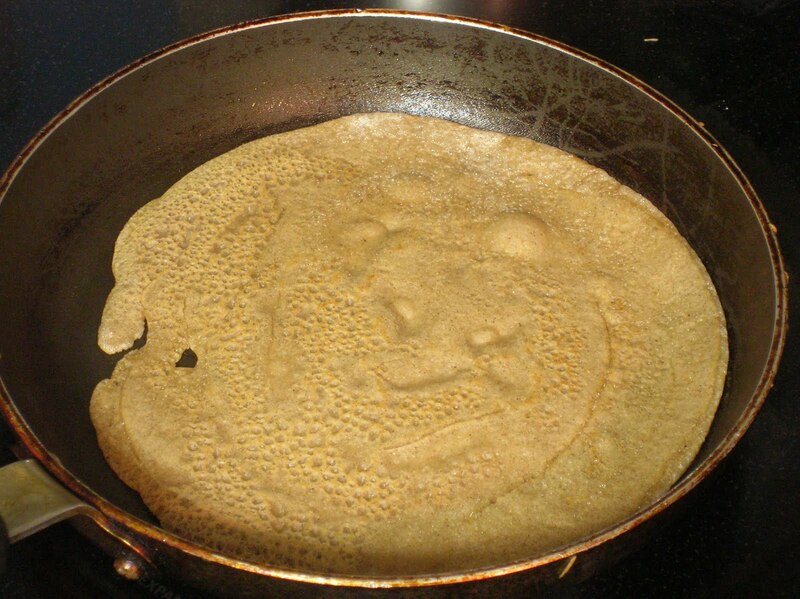 Dosas are sort of an Indian crepe, which are apparently traditionally made from a mix of rice and lentils. The recipe provided for this challenge, however, called for spelt flour in place of these two ingredients. Primarily due to the lack of a Whole Foods in my immediate vicinity, spelt flour is not something easily come by around here, and rather than spend an exorbitant amount of money mail-ordering some on the internet I opted to replace it with more readily-attainable buckwheat flour in my version. The recipe also called for almond milk, yet another difficult ingredient that I swapped for soy milk, and curry powder which I replaced with ground cumin and coriander. I love the flavor of curry powder, and J even makes his own blend which is extremely tasty, but I seem to have a mild allergy to tumeric which makes eating it a bit unpleasant so I try to replace it with other spice blends when I can. I knew I wanted to keep it in the curry sauce, so I thought leaving it out of the dosas themselves would be a safe bet. Making the dosas couldn’t be easier, especially if you have some experience making crepes (which I do). 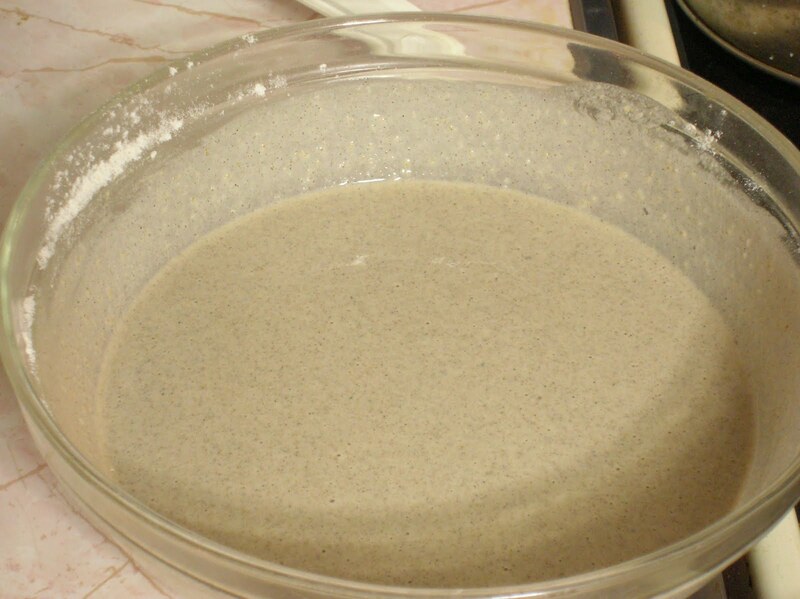 The batter (which calls for water and a bit of baking soda in addition to the ingredients above) came out thicker than a normal crepe batter, but with a perfectly smooth consistency that allowed for an easy portioning and even pan coverage during the cooking process. To cook, you just give a shallow skillet a light coating of cooking spray, then ladle in enough batter to make a thin coating (somewhere around 1/8″ seems to be ideal) and let it cook for a minute or two until you start to see bubbles on the exposed side, much like making pancakes. 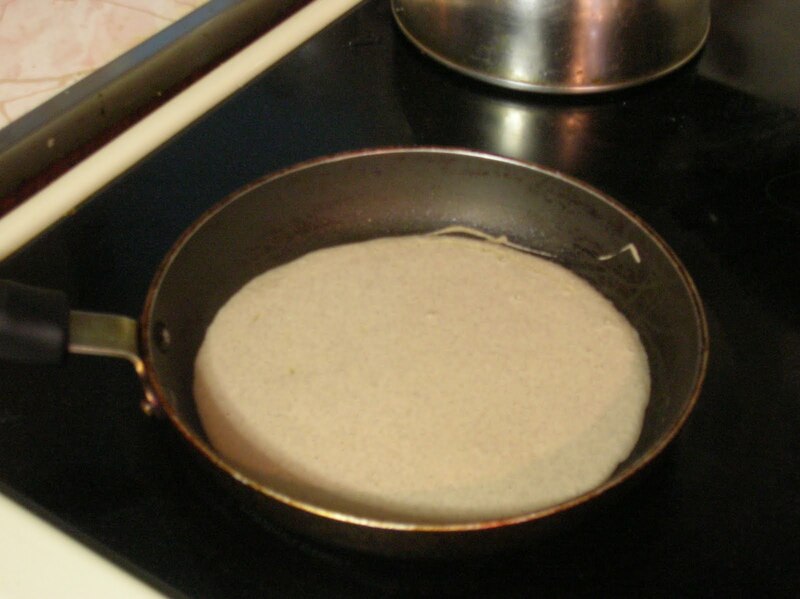 Then you carefully flip the dosa with a thin spatula and let it cook for another minute or two. Since I was making these one at a time I just turned them out onto a sheet of aluminum foil and stashed them in a warm oven until they were all done and I was ready to serve. The day before I’d made my sauce and fillings. The sauce was made pretty much exactly to the recipe specifications, aside from making the same ingredient swap of buckwheat flour for spelt flour. 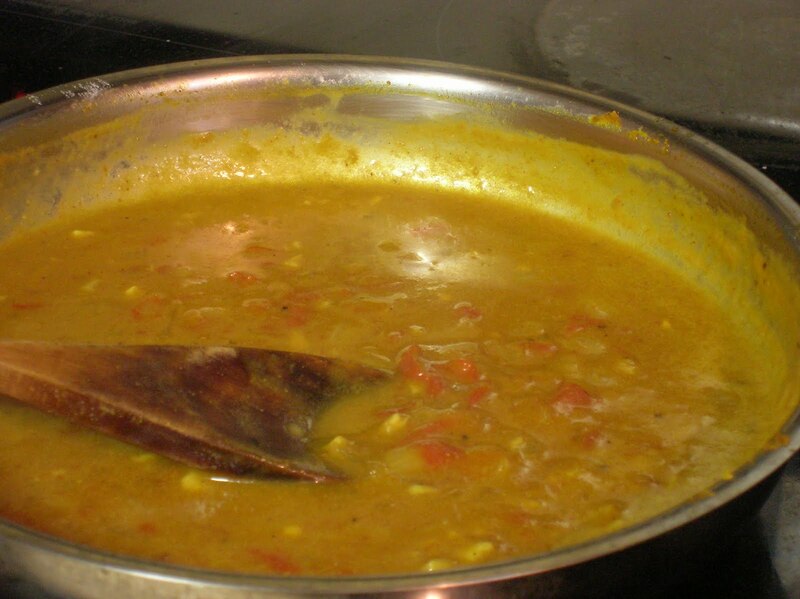 Yielding a fragrant sauce with a savory and just slightly sweet flavor, this mixture of onions, garlic, tomatoes, vegetable stock and coconut milk seasoned with J’s hand-blended curry powder cooked up thick and velvety and delicious. I’d only made 1/3 of the original recipe, not wanting to have ridiculous amounts leftover, but afterward I wished I’d made a full batch because I could see myself using this sauce in a lot of ways, as a topping for plain basmati rice or a dipping sauce for freshly made naan or a glaze for grilled chicken. I really went off the map with the fillings, however. 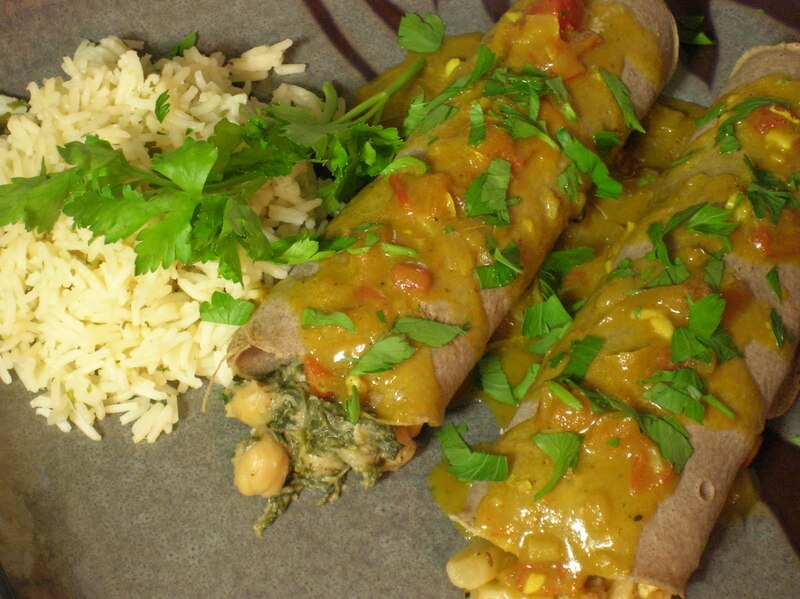 I’d initially intended to make the curried chickpea filling as written because, well, I adore chickpeas and thought the recommended recipe sounded essentially like a cooked and spiced hummus with vegetables. However, the more I thought about it, the more I thought I might want more of a variety of textures and flavors in this meal. I considered a lot of options, not the least of which being a batch of my favorite chana masala to keep the chickpeas dominant, but in the end I decided on a dry-spiced cauliflower stir fry with peas, tomatoes, and whole spices, and something that I’m calling palak chana, which was was a riff on the classic dish palak paneer (Indian farmer’s cheese in a spiced spinach sauce) with chickpeas substituted for the paneer. Both fillings started out with a tarka, which is essentially deeply caramelized onions mixed with toasted spices. 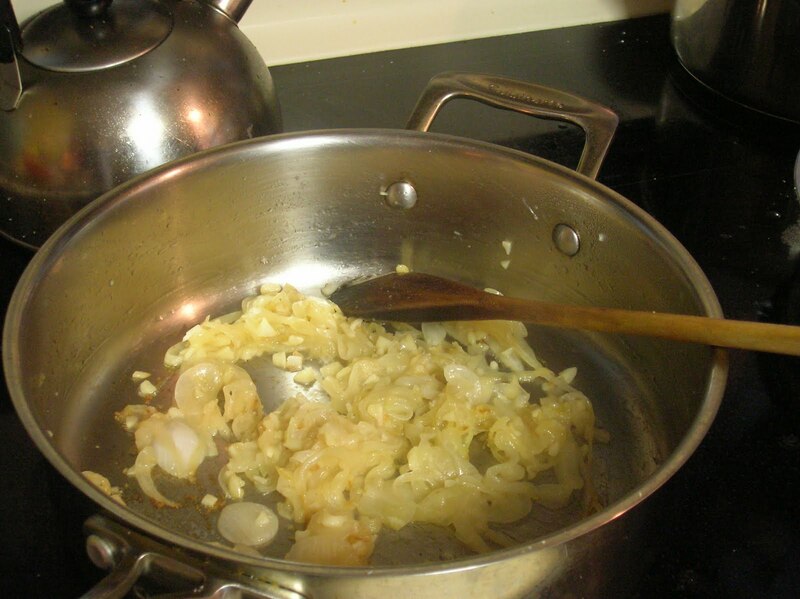 I caramelized an entire thinly sliced white onion with a few cloves of minced garlic thrown in for good measure, then divided it into two portions to make each dish. The tarka for the dry-spiced cauliflower went back into the sautee pan with whole cumin, fennel, and mustard seeds and about a tablespoon of garam masala. 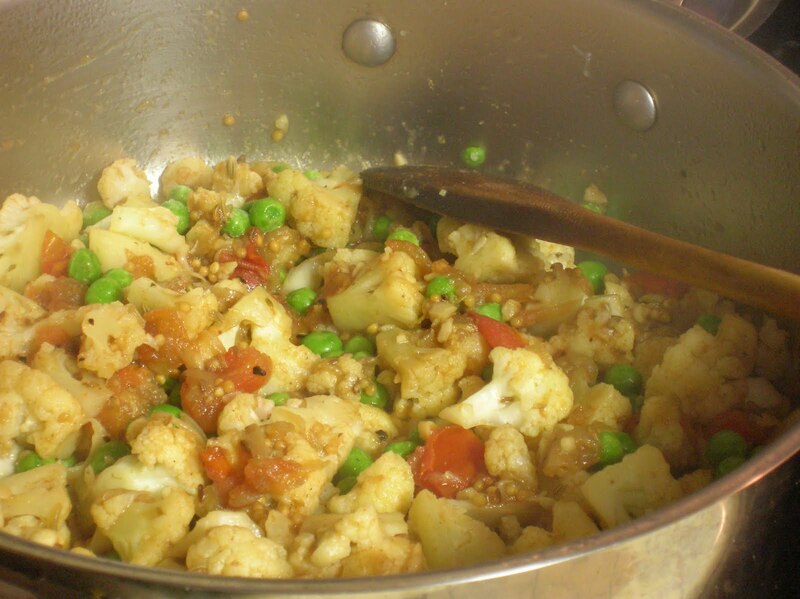 When the spices were toasty and fragrant I dumped in half a head of cauliflower cut into small florets and stirred it around to coat it in onions and spices, then clapped a lid on the pan and let it cook for a few minutes until the cauliflower was beginning to soften. Then I threw in an entire diced tomato (seeded) and a splash of lime juice and cooked for another minute or two until the cauliflower was just tender. I tasted it for seasoning and added some salt and freshly ground black pepper, then threw in a generous handful of frozen green peas. Filling one, finito. For the palak chana, I added some ground coriander, cumin, ginger, and white pepper to the caramelized onions to make the tarka, then added an entire bunch of fresh baby spinach that I’d washed and coarsely chopped to the pan. Once the spinach had wilted down significantly, I dumped in a can of drained chickpeas and about half a cup of soy milk. Once again, I covered the pan and let it cook slowly over low heat until most of the liquid in the pan had boiled away and the spinach had pretty much abandoned its structural integrity to create a nearly smooth and thick sauce around the now softly tender chickpeas. Tasted for seasoning and added a bit of salt, and filling number two was ready to go. On the day we ate this, once all the dosas were cooked and were being kept warm in the oven, I reheated the fillings and brightened them up with a squeeze of fresh lemon juice, and warmed the curry coconut sauce in the microwave. Each of us got a two dosas, one each with each filling, with a generous pour of the sauce and a sprinkling of fresh parsley over the top. I skipped the suggested cucumber garnish because I just don’t like them much, but I did accompany my own with a helping of basmati rice cooked in chicken broth (I know, this was supposed to be a meat-free meal, but the rice wasn’t really part of the challenge anyway and I ran out of veggie stock) with parsley and lemon. Both J and I really enjoyed this meal. The dosas, being something neither of us has tried before, were definitely a hit, and since they’re so easy to make I suspect they’ll be showing up quite a bit in future Indian meals as a quick alternative to naan or parathas, our usual choice of flatbread. I don’t know what they would have been like with the spelt flour, but the buckwheat imparted a subtle nuttiness and hearty texture that I appreciated, and the slightly crisp edges contrasted nicely with the soft and tender insides. I could see wrapping up all manner of curries in these things, and dipping them in all types of chutneys, sauces, and relishes. The sauce, as I already mentioned, was delicious and definitely a winner. And of the two fillings I made the hands down winner was definitely the palak chana. 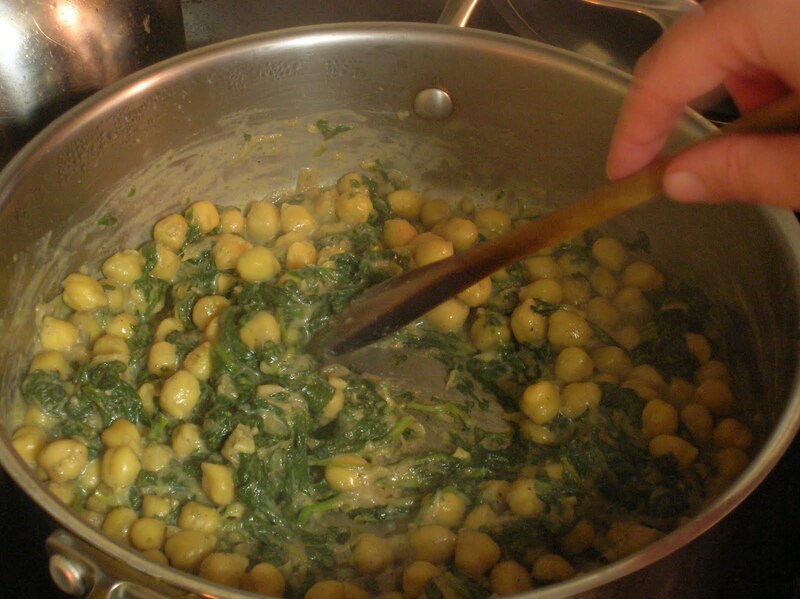 The texture and flavor were perfect, simultaneously smooth and creamy and hearty, retaining just enough of the spinach’s natural earthiness underneath the warmly savory spices and in contrast to the tender, starchy, equally earthy chickpeas. Though I’ll readily admit that I think this meal would’ve been just a tiny bit more satisfying with some shredded chicken in one of the fillings, even without it was filling and delicious, deeply flavorful and complex. And aside from the extra cost of the soymilk and buckwheat flour, I noticed no significant loss or change from making it without any animal products. Makes me wonder what other vegetarian meals we could remake as vegan meals with no obvious loss. And I suppose that’s the point of these challenges, right? To make us rethink and reevaluate our cooking habits and get us to try new things. Between my newfound inspiration and the incredibly tasty results, I would call this challenge a resounding success. This entry was posted in Food, Drinks and Cooking, Table for Two? Archives and tagged beans, Daring Cooks, indian, vegan, vegetables. Bookmark the permalink. 5 Responses to September Daring Cooks: Lookit me, I’m cooking vegan! I love your creative filling and wish I had done something along those lines. Your dosas look gorgeous, and the plating is absolutely mouth watering! Mmmmm, cauliflower! I love how you changed it up a bit! Great job! I'm so glad you enjoyed this challenge!! Your dosas look absolutely delicious =D. Excellent work on both of those fillings. Palak paneer was forefront when I first started thinking about alternative fillings. Your version with the chickpeas looks and sounds delicious. Your version sounds so yummy – congrats!